Zion Market Research has published a new report titled “E-House Market by Product (Skid and Mobile Substation), by Voltage (Medium Voltage and Low Voltage), and by Application Area (Oil & Gas, Mining, Utilities, Chemicals, and Others): Global Industry Perspective, Comprehensive Analysis and Forecast, 2017 – 2024”. According to the report, the global E-House market accounted for USD 982.6 million in 2017 and is expected to reach USD 1,545.1 million globally by 2024, at a CAGR of around 6.9% between 2018 and 2024. E-house is a power station that is used in a remote location where it is difficult to provide a power supply. E-houses distribute power according to the requirements. They are used in various sectors such as oil & gas, mining, chemicals, utilities, and many more. These powerhouses consist of switchgear, transformers, power management systems, bus bars, and other components to distribute power. Increasing usage of the product in the utility sector is fueling the growth of the e-house market. Investment in this sector is increasing the demand for e-house. In 2015, USD 724 billion investments were made globally in the electricity sector. Further, in 2016, the average number of customers served by the electric power industry in the U.S. was more than 150 million, witnessing an upsurge of 0.9% as that of 2015. It is estimated that the total capability of the electric power industry in the U.S. will increase by 20% from 2017 to 2040. Thus, the utility sector is proving to be a major contributor to the growth of the e-house market. Increasing production in the chemical industry is expected to contribute substantially to the e-house market during the estimated timeframe. Global chemical production is expected to grow by 3.4% in 2018 from 2017 with China being the major contributor. In 2016, the Chinese chemical industry generated USD 1.64 trillion at a CAGR of 9.4% from 2012. Further, the U.S. chemical industry is projected to generate revenue of USD 1 trillion by 2020. Thus, it is anticipated that the growth in the chemical sector will propel the e-house market in the near future. Oil & gas, mining, utilities, chemicals, and others are the major application areas for the e-house market. Oil & gas segment is expected to hold a remarkable share in the e-house market during the forecast period. The share is attributed to the massive production in the sector as compared to the other sectors. Further, the e-house market is segmented on the basis of voltage into a medium voltage and low voltage. Medium voltage segment is anticipated to grow at a substantial rate during the estimated period. North America is expected to have a considerable share in the global e-house market during the analysis period. The U.S. is projected to witness a remarkable growth in the e-house market. The growth is attributed to the increase in the utility sector in the country. In the Asia Pacific, China is projected to be the most attractive nation for e-house market owing to rising investments in the mining sector. The government initiative of “Made in China” aims at increasing the demand for Chinese copper by 232,000 tones till 2025. Thus, the growth of the e-house market in this region is still imminent. 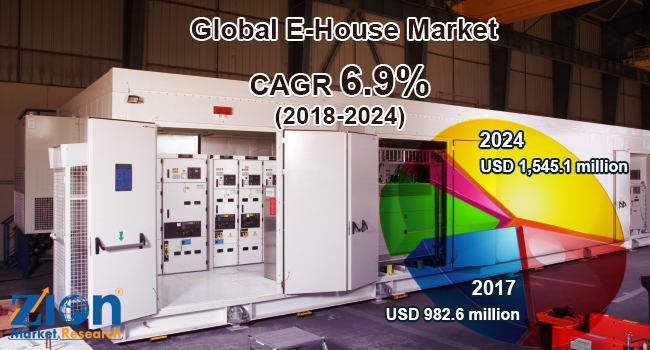 Some of the major participants in the global e-house market are Siemens AG, ABB, General Electric, Schneider Electric SE, Meidensha Corporation, Eaton Corporation, CG Power, WEG Industries, Powell Industries Inc. and TGOOD Global Ltd., among others.